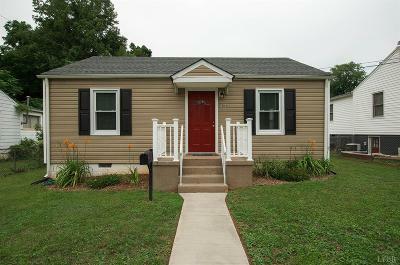 Cute bungalow with updated kitchen. This home was totally remodeled in 2015 with new roof, kitchen, updated bathroom, and energy efficient replacement windows. The heating unit was replaced in 2016 by Terrell E. Moseley. The kitchen conveys with all the appliances. There is a laundry closet in the kitchen with a stackable washer and dryer that does convey with the property. Off-street parking. Big, mostly level yard. Close to Liberty University and University of Lynchburg. Be just about anywhere in Lynchburg in 15 minutes.